This morning I found my way to the studio early. I’m most productive early mornings and I enjoy the quiet of working before there are house sounds, the news, and interruptions. I was stitching some house shapes to incorporate into a new “Home” piece – lots of photo transferred windows next to monotype printed muslin. As I watched the pieces come together, it was something magical. Before the stitching, the pieces I had loosely collaged in place looked random. The edges did not lay flat. Nothing was cohesive. But, line by line, the stitching pulled this loose assortment of shapes into a meaningful image. Each piece began to have its own elements of interest. A plain blue rectangle came to life with criss-crossed stitched lines. As I watched the story take shape, I thought of the pleasure of process in creating textile artwork. Other steps had preceded my morning sewing session. 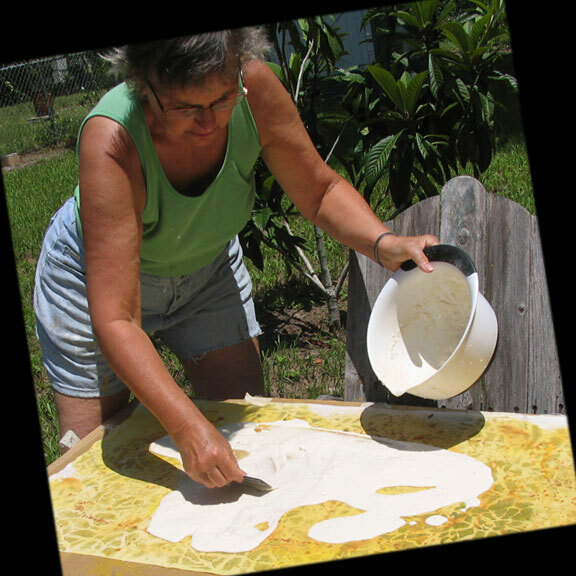 I create the surface designs on all my fabrics, transforming blank yardage with acrylic paint: monotype printing, direct painting, relief prints, resists and stencils. And I had already handled the photo transfers through multiple stages: shooting the image, the computer work of sizing and selecting, and the manual process of making the transfer onto muslin. Outdoor sessions creating fabrics. Pouring wheat paste to create resist prints and some completed fabric painted with hand-cut stencils. And more steps will follow my morning sewing session. Once I have created the parts, I will combine them together on a large backing. At this point I will begin to feel more accomplished and will begin to see the whole picture. Finally I’ll get to the stage of backing and binding. This handwork is more tedious, and not my favorite part of the process. But I approach it with deliberation, put on some music, and find a sense of closure as the work is completed. For today, I am still creating and assembling parts. Parts of this particular quilt – parts of the process – parts of the journey of making.